GDSInc. 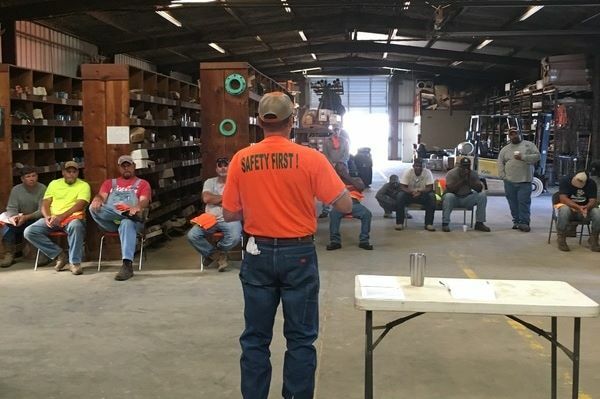 - Safety - Griner Drilling Service, Inc.
Safety Manager, Greg Rayborn, teaching a safety class for the Columbia, MS employees. It is Griner Drilling Service, Inc.'s primary concern to ensure that each employee, subcontractor, supplier, and all those associated with the work or products we provide are afforded the safest possible work place and work environment to minimize the human and economic cost associated with workplace incidents. Griner Drilling Service, Inc. understands that in order to be productive and successful as a company, it takes working efficiently as a team. Attaining that same level of success in safety is no different...It takes the same team effort. Therefore, we have adopted the slogan, "Safety - Individual Commitments to the Group Effort". This reminds us all that each individual must be committed to play a role in not only their safety but also the safety of their coworker and all those around them. Our proactive safety program outlines the policies and procedures for all employees which establishes the safety culture of the organization, while holding each individual accountable. The program provides continuing levels of training and education for all employees based on the requirements needed for each position while acknowledging our failures and successes to ensure that we learn from both.